The usage of mobile learning began in earnest a decade ago, and this was essentially to complement or support traditional eLearning. Over the last few years, the adoption of mobile learning for employee training has been on a steady increase. In fact, it is a crucial and often a significant part of an organization’s training delivery today. What Is Mobile Learning, And What Are The Key Benefits It Offers For Employee Training? 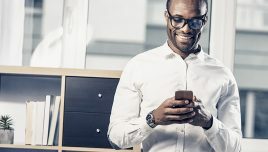 Mobile learning refers to training that is available to the learners on mobile devices giving them the flexibility to learn anytime, anywhere, on the go, and on the device of their choice. They are typically designed to allow learners to use the same course across devices (multi-device support that provides access to courses across laptops/desktops to tablets/smartphones). Mobile learning for employee training addresses the changing expectations of learners on how they want to learn. It also aligns well to the needs of the changing composition of the workforce (that now includes Millennials). 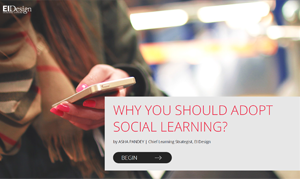 It is also able to leverage on the high impact microlearning formats that make the learning bite-sized and easily digestible. You can also leverage immersive approaches like gamification, videos, and interactive videos, and mobile apps for learning to multiply its impact. A learner-centric approach: It provides the required control to the learners to take the training when they want, on the go, and on the device of their choice. It offers higher learner engagement. It can be used effectively to push for a higher application of acquired learning. It leads to better completion rates. It creates a learning pathway that encourages learners to keep coming back (focuses on facilitating a “pull” vs “push” of the traditional training delivery). It leverages on social or collaborative learning. It can be used to offer formal training, Performance Support (job aids), and support for ILT. What Are The Key Triggers That Are Creating An Increased Adoption Of Mobile Learning For Employee Training? Let me outline some of the significant aspects, such as the fact that the adoption of mobile learning for employee training is increasing. Formal training (particularly, in a learning path featuring microlearning). Performance Support intervention through job aids (within the learners’ workflow and to provide the required support at the moment of their need). Support to Instructor Led Training or ILT. 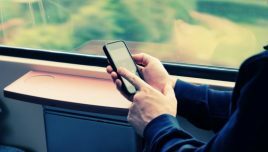 Mobile learning for employee training is slowly transitioning from mobile-friendly to mobile-first. With the maturing of authoring tools to create engaging and immersive learning experiences that are optimized for the consumption of content on mobile devices, mobile learning for employee training is undergoing a significant shift. 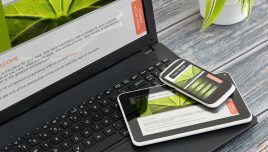 While the previous avatar of mobile learning offered multi-device support (learners could seamlessly work across laptops/desktops and tablets/smartphones), this approach was adaptive or mobile friendly. 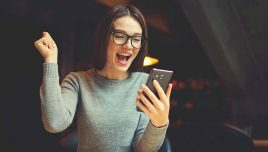 In contrast, mobile learning for employee training is now completely responsive or a mobile-first approach that features learning designs and interactions that are optimized for smartphones. 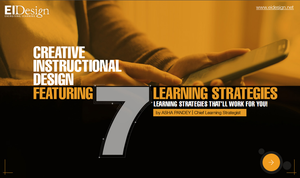 At EI Design, we have a large mobile learning solutions practice. We had set up this practice in 2011, and to date, we have created nearly 2,000 hours of mobile learning content for employee training. 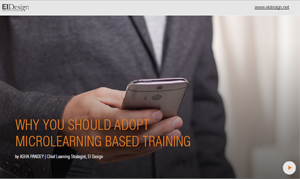 From our huge repository, I showcase 10 ways that illustrate how you can use mobile learning for employee training and meet the required mandate across varied corporate training needs. The showcased examples reflect how you can use mobile learning for both formal training, as well as to offer Performance Support intervention (through job aids). 1. 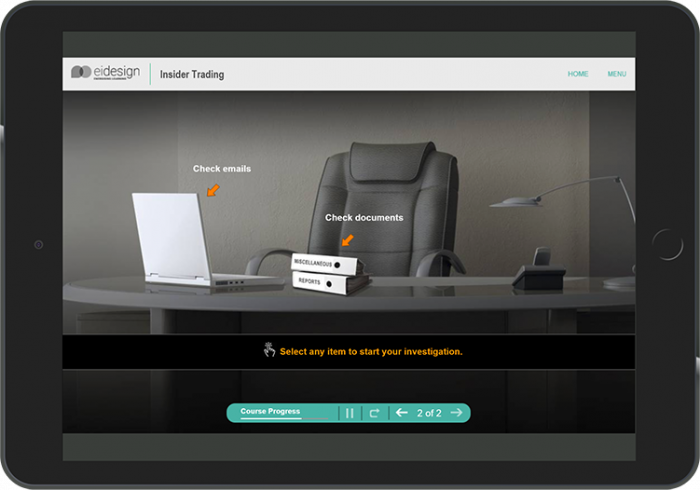 Compliance training: This was a course on Insider Trading, where we used a gamification approach to create an immersive experience using Lectora Inspire 17 as a tool to create the multi-device experience. 2. Induction and onboarding training: The exploration for this induction course was open-form. Learners were allowed to explore in a non-linear fashion across different institutional and operational facets. It also included engaging graphics, narratives, and simple content supported by engrossing interactivities with mobile device compatibility. It also offers a quick turnaround time without losing the visual punch. 3. Application simulations training: This was an application simulation training on the use of Salesforce software. To make the understanding of complex simulations easier, we created a step-by-step interactive simulation. 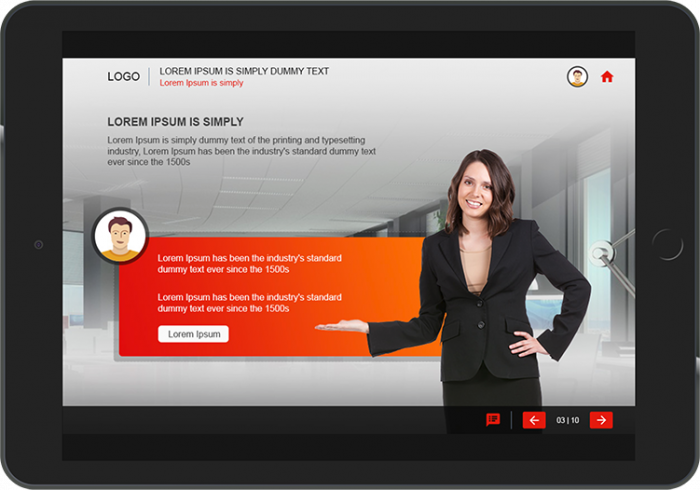 This was done using Articulate Storyline 360 and was made mobile friendly for wider reach to the sales staff. 4. Soft skills training: This was a course on conflict management – a very crucial skill especially for managers. We used a decision-making scenario to drive the complete learning. Built using our custom HTML5 framework, this was made completely responsive to all devices. 5. 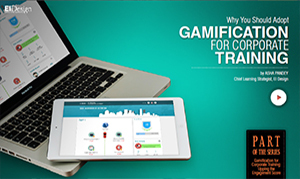 Product training: We used gamification to make the content more engaging in this course. Since this was a large course, it was important to keep the learner busy and hooked. We used scenarios, gamification, and simulations to raise the engagement factor and made it available on mobile devices for the learner to access the modules anytime. 6. 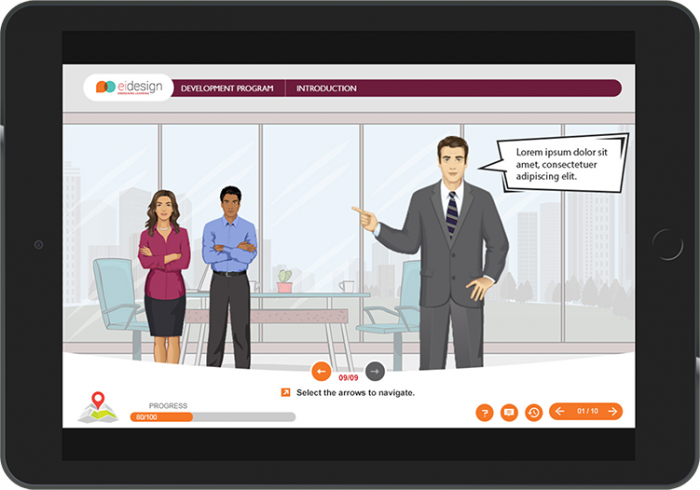 Sales training: Sales training is always challenging and fun to design and build, since it provides opportunities to make the content come to life using characters, conversations, scenarios, animations etc. That is exactly what we did here to train new sales managers on sales development. 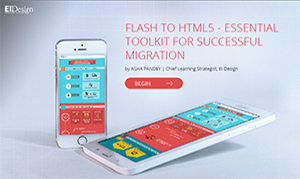 We used our custom HTML5 framework and made the course responsive to all devices. 1. Compliance training: This was a precursor course to a larger course on data security and privacy. This was created in the format of a parallax website with relevant elements popping into the screen as the user journeyed through the short nugget. This was done using custom HTML5 and is responsive to all devices. 2. 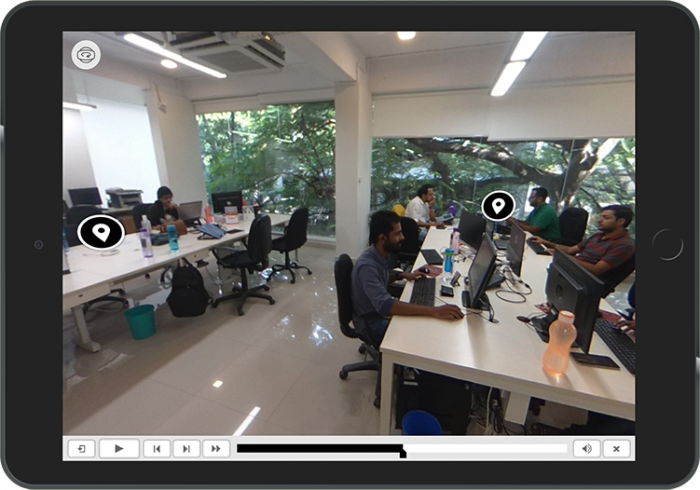 Induction and onboarding training: We created an immersive learning experience using the 360-degree imagery to explain to new joinees about how our company functions, our mission and vision, our teams etc. 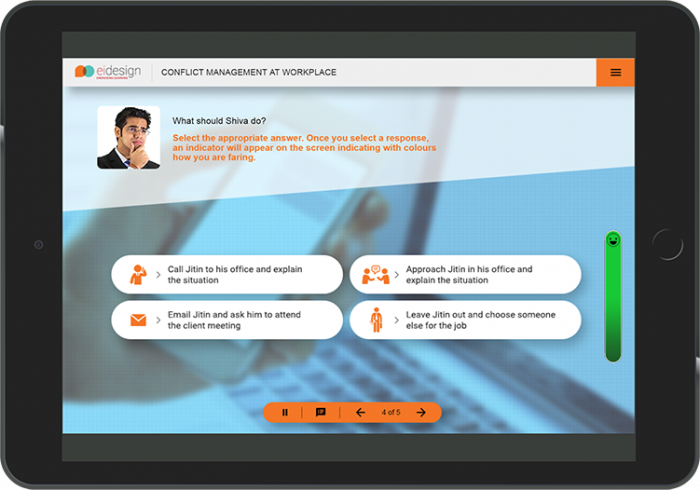 The joinee could explore the complete office virtually and click on hotspots (within the 360-degree imagery) to learn how each domain contributes to the organizational goals. 3. Soft skills training: This was a communication and customer experience training module for all employees of a company. 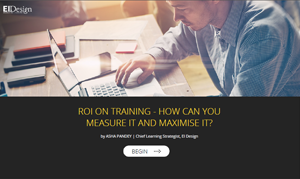 We used microlearning to break down the content into small, relevant, manageable sections for the learner and made it available on all devices, but mainly targeted for mobile devices using our custom HTML5 framework. 4. Sales training: We created an HTML5-based responsive website for a sales framework training for sales agents for a farm products company. 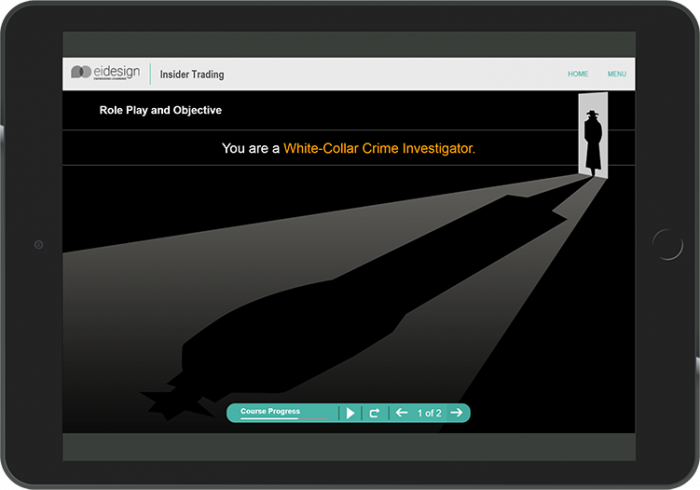 This website served as a learner guide for the 8-week long training program. 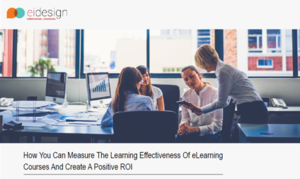 I hope this article shows you how you can leverage mobile learning to provide high-impact employee training. If you have any queries or need any specific support, do contact me at apandey@eidesign.net.